It is winter 1944 and the snow has brought a special quiet to the English countryside in the late evening twilight. The war seems a world away until the tranquility is shattered by the unmistakable roar of Merlin engines, bringing about a harsh reminder of the realities of war-torn Europe. 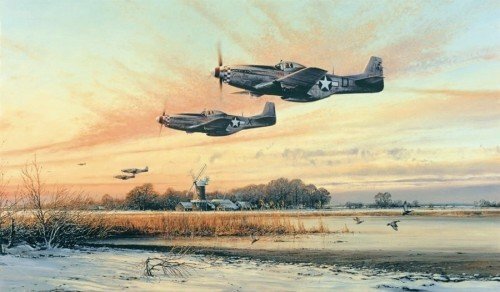 As dusk gathers and just feet above the gently waving reeds of the East Anglian fens, P-51 Mustangs sprint for home bearing the scars of the day’s battle; soon the tensions of aerial combat will be forgotten for a few hours, melting into an evening of camaraderie. Tomorrow will be a new day. This heart-warming piece, originally published in 1992 as a veteran signed limited edition print, sold out quickly after its release. However, the Military Gallery is delighted that, thanks to the introduction of high-definition technology, this classic image is now available as the latest in the hugely popular series of artist signed GICLÉE STUDIO PROOFS on canvas.